At Zesta we have designed many laundries for our customers throughout Melbourne. 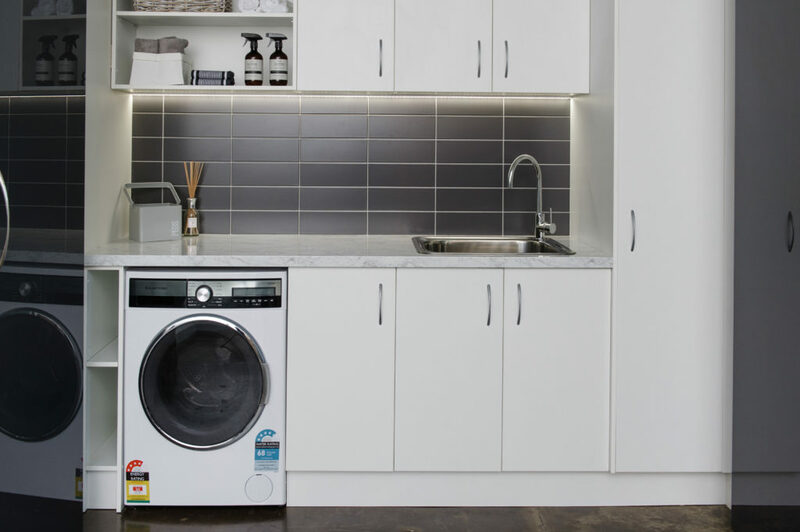 At Zesta we have designed many laundries for our customers throughout Melbourne, in fact many say it is much easier to renovate both the kitchen and laundry at the same time. Killing two birds with one stone by not only saving time but delayed mess and disruption to the home by doing both projects at once makes complete sense. Renovating laundries is similar to kitchens in many ways, which enables us to offer expertise in both. We understand the differing requirements for benchtops, fixtures, fittings and appliances and we only stock and use the very best products and materials. By working with one company that has an impressive track record in both rooms, you are assured of complementary style and elegance to match your existing decor. We love this laundry in Brighton where a well designed wine rack has been added being the perfect place for keeping the wine cool. The linen press creates ample room for all the linen that all families have whilst the overhead cabinets create lots of storage for all the knick knacks found in homes! To discover more about what we can do, please don’t hesitate to get in touch. We will be happy to answer your questions and queries, providing you with all the information you require to choose the best kitchen and laundry to suit your family and lifestyle. Call our team today on 1300 100 555 and we can arrange a consultation with one of our experts. You can also visit us at one of our three locations, or leave your detail in our contact form and we will get back to you as soon as possible. The team at Zesta Kitchens has many years of experience providing people throughout Melbourne with complete solutions. You can rely on our laundry expertise, with the same commitment to quality products and workmanship excellence we apply to our kitchens. 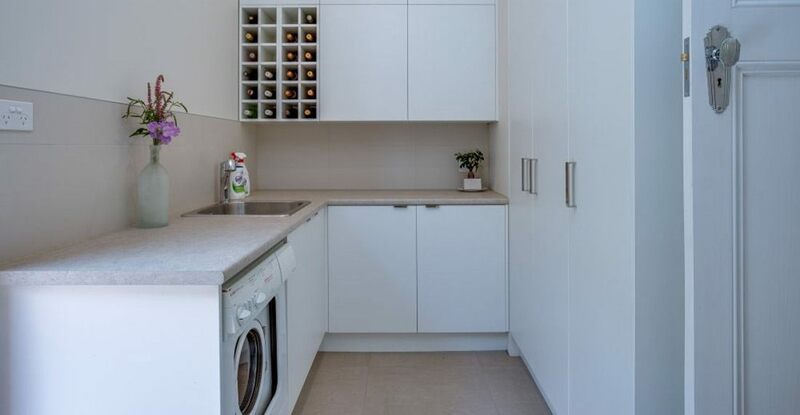 Here is another clever design in Heidelberg, Melbourne where the laundry also acts as extra kitchen storage or a type of pantry – great way to keep the clutter hidden from the adjoining kitchen area.